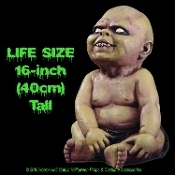 16-inch (40cm) tall foam filled latex prop of a sitting baby with possessed eyes, fang look teeth and greyish dead colored zombie skin. This is one spooky ugly little booger! Disturbing Infant Ghoul with Fangs has a face only an undead mother could love! This Living Dead Mutant Creature looks even more eerie as a horrific costume accessory or when placed in a distressed and cobweb decorated old pram, stroller, playpen, buggy, backpack, baby carrier or high chair!